The Custard TV: The Wrong Mans returns with a Bang! The Wrong Mans returns with a Bang! The Wrong Mans was one of those surprisingly amazing shows that seemed to come from nowhere and was funny, gripping and above all, entertaining. Corden and Baynton were a dream team from the script writing to starring alongside each other. 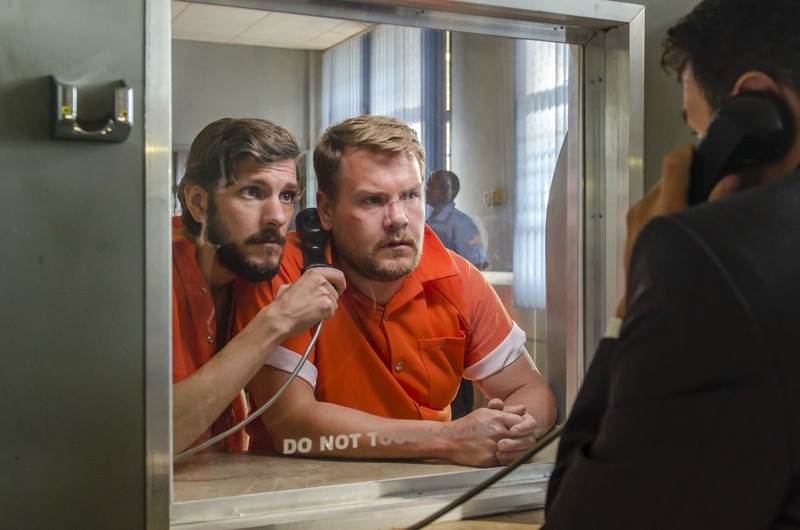 The pair have great chemistry on screen and their friendship transferred to the bond shared by Sam and Phil in the show; they may be the ‘wrong mans’ in the narrative of the series, but as a pair, Corden and Baynton are definitely the ‘right mans’ for the show. We’ll start with a little recap on last series: Sam and Phil from the small town of Bracknell become seriously involved with a dangerous crime web all thanks to Sam answering a call from a phone he found near a car crash. After a series filled with life-threatening events and very awkward moments, Sam and Phil managed to escape the situation largely unscathed (apart from a gun-shot wound suffered by Sam when he jumped in front of Phil) and seemed to return to their normal, and quite boring, lives. However, the series ended with a massive cliff-hanger of a bomb under their car while they sat and joked about explosive handshakes. After being nominated for, and winning, a few awards, The Wrong Mans made its welcome return. The episode picked up right where the last series left off by showing the pair, still unaware of the bomb, driving around Bracknell arguing over which fast-food combo to buy. From the opening, The Wrong Mans re-established the slick and intriguing show it was in the first series. Beginning with a funeral, it could only ever be for Sam and Phil. But how could they ever pull that off? Killing off the two main characters within the first five minutes is unheard of, except maybe on Game of Thrones. Of course the answer was simple; they escaped and moved to Texas on a witness protection scheme. By locating in America, this 2-parter has increased in scale and ambition since the first series. Although it always looked great and managed to create very realistic special effects, this new location has given the show the scale it deserves making the crime web seem even more dangerous by crossing continents. Now working in Texas for a ‘logistics’ company, its clear that the experiences in the first series have changed them both. Phil sees the opportunity to make a new start, and even finds a girlfriend called Rose, who he is naturally head-over-heels in love with, whereas Sam can’t help but miss his old life and yearns to return to the love of his life, Lizzie. The events of the first series have last Sam paranoid. We see him leaving matchsticks in certain places around his flat to see if anyone has broken in and he even manages to work out who to frame to get them to go home. After Phil finds out that his mother is dying, he soon comes to Sam’s way of thinking and the pair plan to escape, with the help of a fake passport. It all looks like it’s going well for the pair who make it to the airport, and despite some very questionable accents (‘cwop of cwoffee’ anyone? ), they make it through to boarding. This is The Wrong Mans so it was never going to be that simple to get our duo back on UK soil. It turned out that their instruments were filled with drugs and the pair was sent to a Texan jail, Orange is the New Black style, only with the promise of release if they reveal everything they know about the illusive and terrifying Carlos Espinosa. However, the creepy ‘lawyer’ and representative of Espinosa played by Ed Helms puts a stop to that and says that they will be released if they manage to get the very scary criminal Nathan’s glass eye as it is the key to some information that Carlos needs. They get the eye, and escape the jail, but just where are they heading to on the plane? We’ll have to wait and find out where the next part of the adventure for Phil and Sam will take them. The Wrong Mans has once again proven that comedy can be dramatic, tense and thrilling. If anything, the first part to the Christmas special was more of what made the first series so brilliant. Another triumph of the show is how self-aware it is of the time it’s writing in; references to Facebook, hashtags and the eerie similarity Ed Helms’ character has to Saul from Breaking Bad all help to situate it within today’s culture. To put it in festive terms, since this is a Christmas special after all; The Wrong Mans is that Christmas present that keeps on giving. You watch the episode and immediately can’t stop thinking about it; it’s the cracker that actually has a pretty good present inside it; it’s the turkey with all of the trimmings. To put it simply, it’s unmissable. The Wrong Mans Concludes Tomorrow at 9.00pm on BBC Two.